Fuel efficiency - reducing fuel bills! 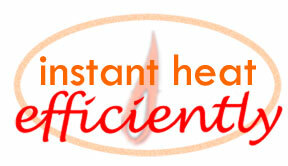 Infrared heat is instant directional heat, where you want it, when you want it. Infraglo offers Standard and 'Supersaver' burners. They both attain the same plaque temperature of up to 900°C and therefore both achieve the same radient heat output. However, the Supersaver burners use 25% less gas to achieve their radiant output. When converting from electric heating to gas, then you can expect even more impressive cost savings - 600-800%. Further efficiencies can be gained by incorporating an automatic ignition system, for the larger process applications. This eleminates the inefficient lighting of individual burners by gas pokers and allows ovens to be shut down for meal breaks or line changes. The Supersaver series can also show appreciable increases in product throughput as well, saving on running costs. Infraglo gas fired infrared radiant burners are uni-directional, compared with electric elements where only 50% of the heat is emitted in the intended direction. Designed to direct their heat emissions onto the work area, whether it be a pan base or a grill, Infraglo burners ensure that little heat is lost or wasted - providing superb efficiency. Whether you're looking to reduce energy costs or taking it a step further to implement ISO 50001, changing to infrared for heating or processing can be an effective step towards saving energy, money and the planet. Objects that we can see have colour because they absorb and reflect some wavelengths of light better than others. Red objects reflect long wavelength red light and absorb shorter wavelength blue light. Infrared is just the same and different materials will absorb and reflect different wavelengths of infrared. If we radiate just the right wavelength of infrared at an object it will absorb the energy more efficiently. For example, if we want to dry water from a cellulose material we should radiate the wavelength of infrared that water absorbs best. This 'absorption peak' for water is between 2.6 and 3.0μm (microns). Operating the burner between 680 and 820°C (approx 1250-1500°F) will give this wavelength and will produce the most efficient drying system. If you're not sure how it works, don't worry, we do! Give us a call - we'll work out the most efficient wavelength for your application.